Scotland’s chief medical officer last week issued guidelines to doctors about how the country will cope with a no-deal Brexit. Dr Catherine Calderwood warned medicine shortages might occur but that the NHS would manage the situation. But diabetics and patient support groups yesterday said shortages are already happening and blamed it on wholesalers and patients stockpiling drugs. They are seeing a scramble for the diabetic drug insulin and glucose-monitoring devices. Aileen Hillis, founder of diabetes awareness group iPAG Scotland, said: “I am contacted by more than 20 diabetic patients a week, all desperately seeking insulin, monitoring equipment, or pumps to deliver their insulin. “Many others tell me they are stockpiling, often with their GP’s approval, because doctors themselves don’t know either what the supply will be like after Brexit. Around 97% of diabetic drugs and equipment is imported, mainly from the EU. The UK Government has taken measures to stockpile three months of diabetic drugs and devices. Dr Philippa Whitford, MP for Central Ayrshire and a surgeon, last week approached Baroness Blackwood, Under Secretary at the Department of Health and Social Care, to raise her concerns. Dr Whitford, said: “The shortage of insulin could be the result of stockpiling by many areas – manufacturers, government stockpiles, wholesalers, pharmacists and patients. Meanwhile, a spokesman for the Healthcare Distribution Association UK, which represents medical suppliers in the UK’s £18.2 billion pharmaceutical sector, said some wholesalers may be hoarding drugs because shortages will cause prices to rise. He said: “A wholesaler’s licence can potentially allow holders to play the market. “If the supply is short the incentive to stockpile will be strong. NHS campaigner and GP, Dr Louise Irvine, said: “Can we really expect the government to fulfil the promises of being able to supply medicines after Brexit when its recent performance has been so poor? Donna Walker, 41, says she has to juggle with a shortage of vital testing strips. The mum-of-four needs them to monitor her unstable diabetes which can cause her to fall into a coma with little or no warning. 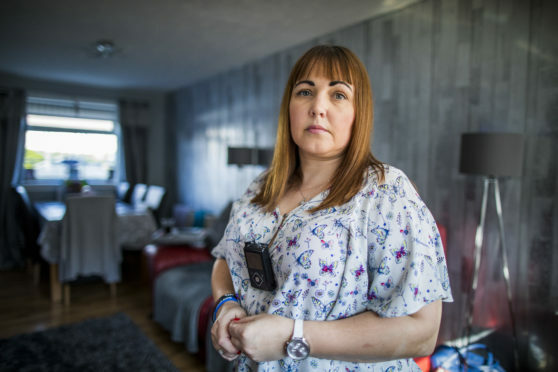 Donna, from Bridge of Weir, Renfrewshire, said: “I have a severe form of diabetes which is difficult to control and need around 10 glucose monitoring strips a day. “I can become ill at any time without warning. “However, I have had to make do with three or four strips instead because I cannot always get them from my pharmacist. “I also use a monitoring patch device which gives more accurate readings, but they are not always available either. “My husband, Steven, has come home from work to find me ill and asleep. The transplant is given patients whose diabetes is seriously difficult to control and monitor. It reduces the risk of severe hypos which cause them to plummet into comas. One of the monitors Donna uses is identical to that worn by Prime Minister, Theresa May, who is also type 1 diabetic. “I often wonder if she has the same difficulty getting hers, but I suspect not,” Donna added. Animation film worker, Felicity Green, 31, from Edinburgh, has to hunt down pharmacies to find her insulin medicine. She was diagnosed with diabetes last November. “I have had to trawl five pharmacies while feeling run-down and exhausted because I was running out of insulin,” said Felicity. “When I was preparing to go on holiday one pharmacy promised they could get it before I left. “But they let me down at the last minute saying it would be three weeks before they would get it in. “I spent the rest of that day looking for it. “I fear that Brexit will worsen this so I am making back-up plans to fly to The Netherlands to insulin. “Fares and a doctor’s appointment will cost at least £300. It’s terrible to have to do this. “Doctors here can’t tell me what the insulin supply will be like after Brexit. “I can’t live without insulin. Without it, I will become seriously ill.
“I know some patients are stockpiling but I am struggling to get my insulin.